This model of ministry explores the wide range of life activities that can influence the wellness of Older Adults. Our communities are filled with businesses, public entities, non-profit organizations, and churches that have resources to benefit older adults. However, many older adults are often unaware of the rich resources in our communities. We seek to have answers to the questions that many do not even know that they will have until a crisis arises. We recognize that aging brings multiple areas of change and that those changes become more individualized as the years pass, which is why we at Winter Grace want to be a resource within the community that can point those in need of services in the right direction. At Winter Grace Senior Ministries, we know that every person, regardless of age is a precious child of God and we seek to honor the image of God within each person. We want to partner with you. 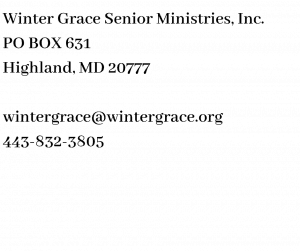 Please email us at wintergrace@wintergrace.org and let’s see how we can serve Older Adults together.